1-4. After this there was a feast of the Jews; and Jesus went up to Jerusalem. Now there is at Jerusalem by the sheep market a pool, which is called in the Hebrew tongue Bethesda, having five porches. In these lay a great multitude of impotent folk, of blind, halt, withered, waiting for the moving of the water. For an angel went down at a certain season into the pool, and troubled the water: whosoever then first after the troubling of the water stepped in was made whole of whatsoever disease he had. It was a feast of the Jews, Pentecost, I believe. The Lord went up on this feast for two reasons: first, so as not to appear by His absence to be opposed to the law, but to be seen celebrating together with the others. Secondly, He went up to the feast to draw more people to Himself by His signs and teaching, especially from among the guileless multitude. For the farmers and craftsmen, who on other days would be busy at their work, always gathered together on the feast days. The pool was called Sheep's Pool, because the sheep intended for sacrifice were gathered there, and after they were slain their entrails were washed in its water. It was the common belief that simply from the washing of the sacrificial entrails the water took on a divine power, and because of this, the angel would come to it at certain times to work a miracle. Here we see divine providence guiding the Jews from the beginning towards faith in Christ, preordaining for them this miracle of the pool. In these Judaic beliefs and practices God prefigured Baptism, which would contain great power and the gifts of cleansing sins and bringing souls to life. He had already given them water for the cleansing of stains, not of the fundamental stain, but those which appeared as such before (the New Covenant), such as the stain of touching a corpse, a leper, and so forth. Then He gave them this miracle of the pool, preparing them to receive Baptism. An angel would come down at certain times and trouble the water, infusing it with healing power. Truly, it is not the nature of water to heal by itself (if this were so it would invariably heal); it is entirely through the activity of the angel that the miracle was accomplished. So it is with us that the water of Baptism is simple water, which, through the invocations made to God, receives the grace of the Holy Spirit to free us from spiritual disease. And this water heals all: the blind, whose spiritual eyes are darkened and unable to discern the better from the worse; the lame, who can neither move towards doing good, nor even advance towards what is better; the withered, who are in total despair, and have no part in anything good. All are healed by the water of Baptism. Before, our very weakness had prevented us from being healed, but now there is no hindrance to our being baptized. In the waters of that pool just one was healed, while the others remained sick; now, even if the whole world should approach at once for Baptism, the grace would not diminish. 5-7. And a certain man was there, who had an infirmity thirty and eight years. When Jesus saw him lie, and knew that he had been now a long time in that case, He saith unto him, "Wilt thou be made whole?" The impotent man answered Him, "Sir, I have no man, when the water is troubled, to put me into the pool: but while I am coming, another steppeth down before me." The perseverance of the paralytic is astounding. For thirty-eight years he lay there waiting, each year hoping to be healed, but always prevented by those who were stronger. Yet he neither gave up, nor despaired. This is why the Lord questioned him, in order to show us the steadfastness of the man, and not of course because He was ignorant of the answer. Not only was it unnecessary for Him to learn the answer, it would have been foolish for anyone to ask such a question, whether a sick man wanted to be healed. The Lord spoke as He did only to bring to our attention the patience of the man. How does he answer? With great kindness and gentleness. "Yea, Lord, I wish to be healed, but I have no man who is able to carry me into the water." He does not answer with blasphemy; he does not rebuke Christ for asking a stupid question; he does not curse the day of his birth as we often do, fainthearted as we are, when undergoing a much lesser affliction than his. He answers meekly and pleadingly, indeed not knowing to Whom he was speaking, and also intending perhaps to ask Christ to carry him into the water. Note also that Christ did not say, "Wilt thou that I make thee whole?" lest He appear to boast. 8-10. Jesus saith unto him, "Rise, take up thy bed, and walk." And immediately the man was made whole, and took up his bed, and walked: and on the same day was the Sabbath. The Jews therefore said unto him that was cured, "It is the Sabbath day: it is not lawful for thee to carry thy bed." He commands him to pick up his bed in order to confirm that the miracle was not an illusion, for the man would not have been able to carry his bed if his limbs were not firmly and solidly knit together. The Lord does not require faith of him before the healing, as He did with many others, for the paralytic had never seen Him work any signs. And of the others of whom the Lord did require faith, it was not before but after He had performed miracles in their presence. See how the paralytic immediately heard and believed the Lord's command. He did not hesitate and say to himself, "Is he not mad to command me to get up at once? I have been here thirty-eight years without ever being healed, and now I should suddenly stand up?" With no such thought, he believed, and rose. The Lord heals on the Sabbath, teaching men to understand the observance of the law in a new way, that they should not think that it is by bodily rest that they honor the Sabbath, but by refraining from evil. How could the law forbid one from doing good on the Sabbath when the law comes from God, Who is always doing good? 11-13. "He that made me whole, the same said unto me, Take up thy bed, and walk." Then asked they him, "What man is that which said unto thee, Take up thy bed, and walk?" And he that was healed knew not who it was: for Jesus had conveyed Himself away, a multitude being in that place. One must marvel at the boldness of the man towards the Jews. 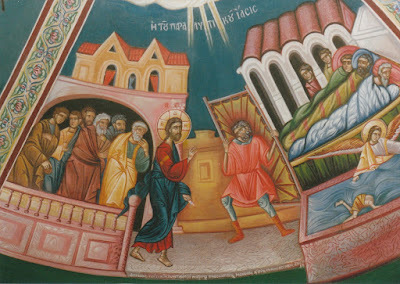 While they badgered him, saying, "It is not lawful for thee to carry thy bed on the Sabbath," he boldly proclaimed his Benefactor, "He that made me whole, the same said unto me, Take up thy bed, and walk." It is as if he were saying, "It is nonsense to forbid me to obey the man who saved me from such a long, hard sickness." The Jews do not ask him, "Who is it that made thee whole?" but, "Who is it that said unto thee, Take up thy bed, and walk?" It is as if they chose to be blind to the good, but were obsessed by what they considered to be a transgression of the Sabbath. Jesus "conveyed Himself away" so that the man's testimony to his healing would be evidence of the truth, and not liable to the accusation that he was attempting to curry favor with Jesus by crediting Him with the miracle. (For not only did the man not know who Jesus was, but) Jesus Himself was no longer present on the scene. Jesus left that place for another reason as well, to avoid arousing the Jews to further anger. He knew that the mere sight of the object of envy is enough to ignite a flame of spite. Therefore, He allows the facts of the matter to be examined entirely on their own merit. And the more the Jews accuse, interrogate and examine, the more swiftly travels word of the miracle. 14-16. Afterward Jesus findeth him in the temple, and said unto him, "Behold, thou art made whole: sin no more, lest a worse thing come unto thee." The man departed, and told the Jews that it was Jesus, which had made him whole. And therefore did the Jews persecute Jesus, and sought to slay Him, because He had done these things on the Sabbath day. By the Lord's words to the paralytic, "Behold, thou art made whole: sin no more," we learn first of all that illness in man stems from sin. Secondly, we learn that the Christian teaching about hell is true, and that the punishment there is eternal. Where are those now who say, "I fornicated for one hour; how [is it possible] that I will be punished eternally?" Behold this man, whose years of sin were far fewer than his years of punishment, seeing that his punishment lasted almost the length of a man's life. For sins are not judged by their duration in time but by the nature of the transgression. We also learn from the Lord's words that even if we have paid a harsh penalty for our former sins, and then return again to those same sins, we will be punished more severely than before. Indeed, this is only right. If a man does not correct his ways after his first punishment, he must be treated more severely, because he is insensible to the good and scorns it. But why are not all punished in this manner? We see that many of the wicked are healthy and energetic, and pass their days happily. But their lack of sufferings in this life becomes the grounds for even greater punishment in the next life. Saint Paul makes this clear when he writes, "But when we are judged by the Lord, meaning, in this life, we are chastened, that we should not be condemned with the world, that is, in the next life" (I Cor. 11-32). What we receive in this life are only admonitions: in the next life they are truly punishments. So then, are all illnesses the result of sin? Not all, but most. Some illnesses arise from sin, as we see with the paralytic and also with one of the kings of Judah, who suffered pain in his legs as a result of sin (III Kings 15:23); other illnesses are given as a testing and proving of virtue, as with Job; yet other sicknesses result from overindulgence of various kinds, such as gluttony and drunkenness. Some have supposed that His words, "Sin no more," indicate that the Lord knew that the paralytic would reveal Him to the Jews after He met him in the temple. But this is not so. It is apparent that the man was pious, for the Evangelist says, "Jesus findeth him in the temple." If he had not been pious, he would have given himself over to relaxation and eating and drinking, and run home to escape the ravings and questioning of the Jews. But none of these things dissuaded him from going to the temple. After recognizing Jesus, see how gratefully he proclaims him to the Jews. He did not say the words they wanted to hear, "It is Jesus Who told me to take up my bed," but instead, "It is Jesus Who made me whole." These grateful words infuriated them, for they held the breaking of the Sabbath to be a crime. If the Jews then persecuted the Lord, how was the man at fault by revealing Him to them? With sincere motives he proclaimed his Healer to them in order to draw others to believe in Him. If they persecuted the One Who did good things, it is their own sin. Understand the sheep's pool to represent the grace of Baptism, in which the Sheep sacrificed for us, the Lord Jesus, was washed when He was baptized for our sake. This pool has five porches, symbolizing the four great virtues plus the divine contemplation of dogma which are revealed in Baptism. Human nature, paralyzed in all its spiritual powers, lay sick for thirty-eight years. It was not sound in its belief in the Holy Trinity (i.e. 3), nor did it have a sure belief in the eighth age (i.e. 8), that is, the general Resurrection and the Last Judgement. This is why it could not find healing, for it did not have any man to put it into the pool. That is to say, the Son of God, Who intended to heal through Baptism, had not yet been made man. But when He was made man, then He healed our nature and commanded us to take up our bed, that is, lift up our body from the earth, making it light and free, not weighted down by flesh and earthly cares, and raising it from slothfulness so that it is able to walk, which means, active in doing good. The troubling of the water in the pool suggests the stirring up the evil spirits lurking in the waters of Baptism, crushing and choking them by the grace of the Holy Spirit. May we also obtain healing, for we are paralyzed and motionless in the doing of anything good; we also have no man, that is, no human and rational thought, which distinguishes us from the irrational beasts, to carry us into the pool of tears of repentance, in which the first who enters is healed. He who procrastinates and puts off his repentance until later, and does not hurry to repent now, does not obtain healing. Hasten to be the first to enter this pool, lest death overtake you. And there is an angel which troubles this pool of repentance. What angel is it? The Angel of Great Counsel of the Father, Christ the Saviour. (see Is. 9:6). For unless the divine Word touches our heart and troubles it with thought of the torments of the age to come, this pool cannot become active and effective, and there is no healing for the paralyzed soul. The pool of repentance may also fittingly be called a sheep's pool; for in it are washed like sheep the inward parts and thoughts of the saints who are made ready to become a living sacrifice pleasing to God, making them innocent and guileless. May we also obtain healing, and afterwards be found in God's holy temple, no longer stained by unholy thoughts, "lest a worse thing," the eternal torments, "come unto us."